All items of jewelry are potentially dangerous. The term "dangerous" can sometimes be ambiguous and controversial, therefore in order to be uniform and consistent any kind of jewelry has to be forbidden. Players are not allowed to use tape to cover jewellery. Taping jewelry is not adequate protection. Rings, earrings, leather or rubber bands are not necessary to play and the only thing they can bring about is injury. In order to avoid "last minute" problems, teams should inform their players in advance. Necklaces, rings, bracelets, earrings, leather or rubber bands etc. are not allowed. provide a reasonable degree of protection. each goalkeeper wears colors that distinguish him from the other players, the referee and the assistant referees. 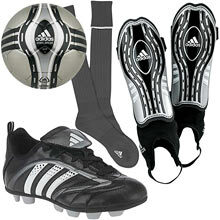 A player must not use equipment or wear anything that is dangerous to himself/herself or another player. Modern protective equipment such as headgear, facemasks, knee and arm protectors made of soft, lightweight, padded material are not considered to be dangerous and are therefore permitted. New technology has made sports spectacles much safer, both for the players themselves and for other players. the player is only allowed to re-enter the field of play when the ball is out of play. A player who has been required to leave the field of play because of an infringement of this Law and who enters (or re-enters) the field of play without the referee's permission is cautioned and shown the yellow card. the match is restarted by an indirect free kick taken by a player of the opposing side, from the place where the ball was located when the referee stopped the match. Players must not reveal undershirts that contain slogans or advertising. A player removing his jersey to reveal slogans or advertising will be sanctioned by the competition organizer.